Live With Meaning. 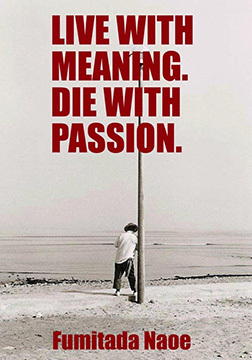 Die With Passion. A philosophy for life is explored by Fumitada Naoe, a man who took himself from the depths of an Asian shanty town, through the bitter discrimination of a wholly homogenized society, to the heights of success in one of the world's most economically powerful nations. His philosophy for living, told through poetic essays and emotionally charged photography, isn't how to create wealth, but how to live one's life with love, passion, and to the fullest. The strong messages and images in this book have been recognized by many young readers as an innovative self-development guide. Born in a shanty town of Taiwan, Fumitada plunges in and makes his own way to success within Japan's affluent business sector. Determined to be the top entrepreneur in the world, he is propelled by the death of a loved one and to overcome the discrimination he has faced throughout his life. He starts his own company with virtually no experience or funds and builds it to a thirty million dollar business within in a year. Fumitada's musings are as inspiring as they are moving. Released in Japan September 2006, this book has sold 24,000 copies. His stoical life, from being raised in an impoverished environment to succeeding in the business world, has been featured in TV programs and magazines. At age of 29, in the lifestyle and business magazine "Nikkei Business Associe," he was selected third by the nation's students as a top role model for 2007. He has also been featured in popular primetime TV shows on all major Japanese networks, such as: NHK's "Today's Close Up," Asahi TV's "Super J Channel," Fuji TV's "Stamen." Born 1977 in Taiwanese shantytown, Fumitada Naoe is now the president of Sanctuary, Inc. Fumitada moved to Japan as a child and grew up always fully aware of his Chinese heritage, in a country widely known for not being very accepting of it. After his step father's company went bankrupt, his entire family broke apart. This gave him a profound sense of the uncertainty in life which propelled him into the goal of becoming the top entrepreneur in the world. In 2003, he established Sanctuary Inc. to reform the traditional funeral service so that it may be a truly happy ceremony for both the deceased and the grieved. At the age of 27, he developed it into a 30 million dollar company.